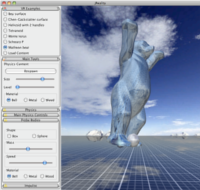 jReality is a Java based, open-source, full-featured 3D scene graph package designed for 3D visualization and specialized in mathematical visualization. It provides several backends, including a JOGL one for Java based OpenGL rendering. JReality is thread-safe, has a flexible shading model based on an attribute-inheritance mechanism in the scene graph, device-independent user interaction and support for true 3D audio (JACK). Furthermore, there are many support classes for transformations and geometry. It has a plugin system for assembling custom viewers, an active forum and a growing set of tutorial examples to help developers interested in using jReality to solve their Java 3D problems. For further information please look here. The newest version of jReality can be found here. It contains updated library files, fixed bugs and new bugs. The wiki tutorials will remain the main source of documentation. There is also a forum about everything related to jReality. From today onwards jreality will be maintained but not as activley developed as before. A final version is on its way. Due to the security reasons this website and the tutorial site have been made static. The latest release of jReality is ready. -fxaa in jogl3, together with more options in the “effects” dropdown menue. The updates for the website are completed. We started with version numbers. We removed awt-color.class from src-core (first step for android backend). We stopped the support for the old Viewer “ViewerApp” and removed the files from the project. We started working on a new toolsystem for atomatic-jinput-device detection. We are switching permanently to gitorious, the svn repository won't be updated anymore. jReality-based student projects in mathematical visualization available for viewing. Check out the latest student projects, accessible from the web-site of the Mathematical Visualization course at TUB, Winter Semester 2012 . These projects are all based on jReality, and illustrate some mathematical theme, mostly chosen this semester from the area of discrete groups and their associated tessellations. The most bugs should be solved now and we moved jReality successfully from OpenGL 1.3 to OpenGL 2. Our new backend will be based on OpenGL 3.3. For first impressions follow these instructions. We are planing to switch jReality form Svn to Git to facilitate the work of external developers. We updated the phpBB-forum to version 3.06. Now there is a RSS-feed available for the forum. 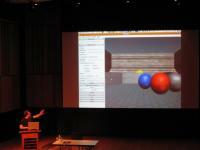 The recently developed audio features of jReality were presented at the International Computer Music Conference ICMC 2009 in Montreal, Canada. jReality will be presented at the ACM International Conference on Multimedia 2009, as part of the Open Source Software Competition. See our new Gallery section for lots of stills created with jreality. 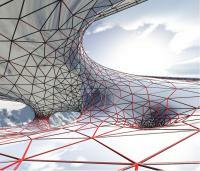 The video about the Berlin Mathematical School is part of the DFG Video Portal, and shows jreality running in the Portal at TU Berlin, Mathematics Department. The portal is a 3-wall CAVE-like installation with passive stereo 3D and head-tracking. The jbullet physics engine has been integrated into jReality. The project also contains collision sound synthesis, based on Jass. For anonymous access login as user guest with empty password. Test drive this webstart demo now. Experience mathematical constructs as physical objects! You can even through things at them (middle mouse button)! Includes real-time synthesized audio. This may require a fast computer to run smoothly. You can turn off audio, uncheck “sound” in the “Main Physics Controls” Panel on the left. Comes with the necessary 3rd party jars and an eclipse project file for easy configuration. Each tutorial example now includes a link to run as a Java webstart! We have started to implement a new plugin system which makes creating customized jReality applications easier than ever. See Stefans talk. about his plugin API. jReality is part of the Exhibition Imaginary – mit den Augen der Mathematik. The exhibition will visit many places in Germany during the Math year 2008. The image shows a boy playing with our jreality installation at Wissenschaftssommer in Leipzig. We have implemented the jReality VR viewer. 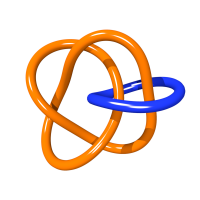 It allows loading 3D arbitrary data files but also includes a set of examples, several interesting mathematical surfaces as well as the Matheon buddy baer. The whole GUI for this application can be immersed into the 3D scene, so this application is also fully usable in immersive 3D environments (CAVEs). Run as [Java™ Web Start]. To get started, simply look at the help tab, or see the user manual in our Wiki.